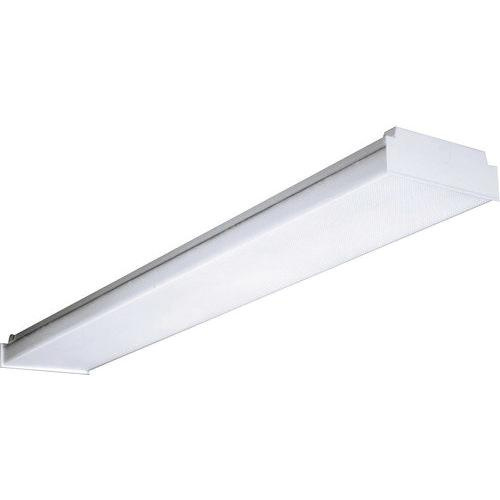 Columbia Lighting Low-profile wraparound fixture in baked white enamel finish, has heavy gauge steel housing. It has clear acrylic prismatic diffuser with flat bottom and vertical sides. Wraparound fixture uses four 32-Watt T8 lamps. Lamp with electronic instant start ballast has voltage rating of 120 - 277-Volts. Wrap-around fixture measures 48-Inch x 14-5/8-Inch x 2-25/32-Inch. Wrap-around fixture is UL/cUL listed, CSA certified and NYC approved.